Burr Ridge, Illinois – December 3, 2018 - Transient Specialists, a leader in EMC rentals for over 30 years, announces that they will be offering rentals, sales and a set-by-step guide of the IEC 61000-4-2 setup including all components and cords. This complete ESD immunity setup includes vertical coupling plane (VCP), horizontal coupling plane (HCP), ground coupling plane (GCP), ESD table, and all required cords. Transient Specialists conveniently located in the mid-west offers a variety of EMC test equipment rentals to accommodate your testing needs. Our rentals include technical support on the equipment, weekly and monthly rentals, and 2 days each way of transit time free with each rental. With the experience and equipment Transient Specialists is solution when testing needs to be completed and capital funds are limited. EN/IEC 61000-4-2 puts forth specific requirements for all components of the setup for this electrostatic discharge (ESD) standard. This setup can be rented or purchased as a whole, or individually to enhance a preexisting test setup. 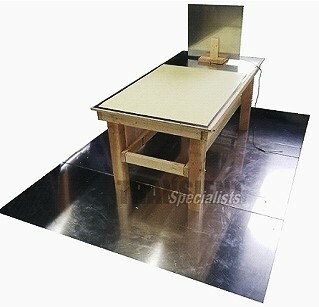 The setup includes, an all wood table with removable legs, vertical coupling plane (VCP), horizontal coupling plane (HCP), insulating paper/foil, ground coupling plane (GCP), resistors and wire, all meeting the requirements of the standard. Transient Specialists also offers many ESD Simulators to facilitate testing to IEC 61000-4-2:2008 including the NSG 435, ESD3000, MZ-15, and Dito. They also provide a step-by-step guide to manufacturing this IEC 61000 ESD series standard. Since 1978, Transient Specialists has been at the forefront of EMC test equipment rentals. They offer flexible rental periods and a variety of products from different suppliers to meet testing needs. The relentless drive to exceed customers' expectations by quickly providing solutions and excellent service has helped distinguish themselves within the industry.